Every time I've said Imran Khan's not really what a politician should be, his supporters have bashed me quite hard. The last time I wrote about Imran Khan some of his stooges went so far as to degrade me and tell me I didn't know the first thing about him. They criticised me for failing to appreciate his magnanimity, awesomeness and brilliance. They told me he built Namal Model College. They also said that Khan was a fortuitous and upright man who valued his principles more than he valued power, fame and money. But they were all wrong. So very wrong. You see I had been advocating that Khan put his emotions aside when he's politicking. His followers told me he would never do that because that is what real politics is all about. Well if that indeed is the case, isn't Imran Khan the world's biggest hypocrite then? Well not the biggest because we have the likes of Rehman Malik, Asif Zardari, Nawaz Sharif, Yusuf Gilani who take the cake from Khan but you get the point. What in God's name was Imran Khan thinking when he decided to shun his perpetual hate of Altaf Hussain and called him and decided to let the world know that he appreciated Altaf "Bhai's" stand against the government and America? 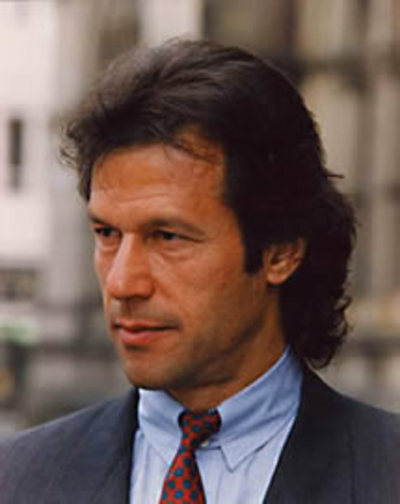 If memory serves me correctly, and it does on this occasion, Imran Khan filed a case against Altaf Hussain in Pakistan. The court rejected the petition because Altaf Hussain is a British citizen. Imran Khan then wanted to go to Karachi to hold a rally against Altaf "Bhai" in Altaf Hussain's own home town. Some said it was a dangerous move. Others said it was stupid. But whatever it was, we never really found out because as it so happened the MQM banned Khan from entering the city. Khan also went onto Geo TV's show Capital Talk hosted by another hypocrite (Hamid Mir) and left seething with rage when Babar Ghauri taunted him repeatedly for allegedly fathering an illegitimate child. That's when Imran Khan decided enough is enough: He would go to the UK and file a murder case against Altaf Hussain and file an extradition request with the British authorities. We never got to hear what became of that case. Khan repeatedly claimed Altaf Hussain was responsible for the murders of more than 235 people and yet, he had no qualms about rubbing shoulders with him and shaking hands (figuratively for those of you who will point out and complain Khan and Hussain never met!) when it came to serve his agenda. Khan hates the Americans. And apparently, now so does Altaf Hussain. What better opportunity could there be than ride on the back of the urban party from Karachi which somehow always manages to gets its way? The lives of 235 people did not become a hurdle, nor did they prick Khan's conscience. His fan followers also claim torrents about his honesty. Apparently he hasn't been honest with them either. But I suppose a person who claims that he will make sure Altaf Hussain ends up in jail and then clamours to support his agenda when it suits his own isn't what one would call honest in the first place. The irony of this whole affair is that Imran Khan has finally managed to use his brain. Siding up with Altaf Hussain is nothing short of genius. But his supporters, well that's a different story altogether now. If they claim that what Khan did by siding with Altaf Hussain is correct and right, then they'll be the biggest two-timers on the face of the planet earth. It is sad that Imran Khan had to ditch his honesty drama and principles façade; but maybe this is the only way he will be able to make an impact on the destiny of this sad nation. My only hope is that Imran Khan's wavering ways don't become a permanent feature of his politics.